Westley, the handsome farm boy who risks death (and much worse) for the woman he loves; Inigo, the Spanish swordsman who lives only to avenge his father's death; Fezzik, the gentlest giant ever to have uprooted a tree with his bare hands; Vizzini, the evil Sicilian, whith a mind so keen he's foiled by his own perfect logic; Prince Humperdinck, the eviler ruler of Florin, who has an equally insatiable thirst for war and the beauteous Buttercup; Count Rugen, teh evilest man of all, who thrives on the excruciationg pain of others; Miracle Max, the King's ex-Miracle Man, who can raise the dead (kind of); and of course, Buttercup . 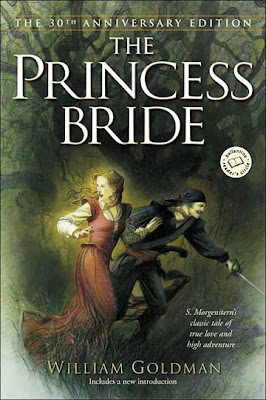 . . the princess bride, the most perfect beautiful woman in the history of the world!